Read about the first two sessions of Day Three here. From Workman: The High Divide by Lin Enger, and several big beautiful nonfiction books, from dinosaurs to whiskey to molecules and the ocean. My notes from this session are a bit haphazard due to the pace of the panel and people jumping in with suggestions and comments, so I may not have ascribed all the suggestions correctly. 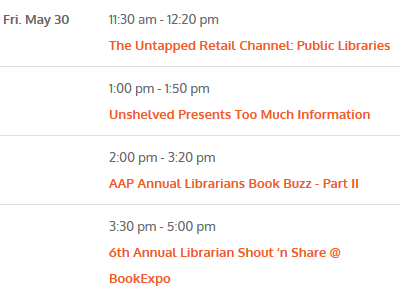 I’m just going to list books that I first heard about at the Shout ‘n’ Share, omitting any that I’d already heard about during BEA (from the Editors’ Book Buzz, Librarians’ Book Buzz, giant posters hanging in the exhibit hall, etc.). And that was the end of BEA for me. Stay tuned for a (very belated, by now) recap of BookCon.